Time spent on the road can and should be leisurely, without fear of death or of injury. Unfortunately, the reality of the road is that not everyone is going to be paying attention one-hundred percent of the time. Negligence exists, it’s part of human nature. One moment we may be paying attention to the road, another moment may be thinking about something else entirely, and will only be barely paying attention to what’s happening in front of us. For truck drivers, this is something that can happen after many long hours of driving from state to state. Sleep deprivation, and the constant almost hypnotic view of a road that never seems to change can drive even the most experienced drivers to moments of inattention. A normal inattentive driver can be hazardous, but a truck driver is something that could be downright disastrous. At Wolfson Law Firm, we understand that such an event can cause untold amounts of distress, for both parties involved. That’s why giving a toll-free call to 855-982-2067 for a free consultation is one of the smartest decisions you can make. Especially when you’re dealing with the horrible injuries that can come from these accidents, either physical, or emotional. In 2016, over four thousand large trucks and buses were involved in fatal crashes, according to the FMCSA (Federal Motor Carrier Safety Administration) That’s a three percent increase since the year before. Florida too is listed as one of the top ten states with the highest average of fatal truck and bus accidents since 2014. You would think too that some of these crashes happened in busy highways or in cities where most car accidents tend to occur. It’s noted that 61% of said bus and truck accidents happened in rural areas, with 27% happening in work zones. 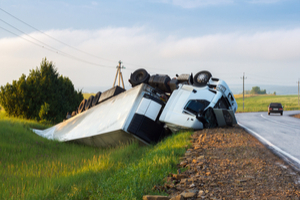 Should you find yourself in a truck accident, it’s important that you know the facts as to how often these things may occur. With such heavy statistics working against them, it’s no surprise that truck companies have on-call investigators ready to look through the accident that occurred. This is not a good thing, as these investigators are not there to help you, but instead to help the Truck companies build defenses for the inevitable personal injury and wrongful death claims that are going to be coming their way. While we recommend doing your research, working quickly also is to your favor, as finding experienced and well-versed attorneys can make the difference in you getting the compensation you deserve. Being injured in a truck accident can leave you and your loved ones in a state of disarray. Be it because of the life-threatening injuries you may receive, or because of the death that is possible to occur when one of these massive truck tips over. If you’re looking to ensure you receive the compensation you need, and deserve, then it all begins in finding the best truck accident lawyer in West Palm Beach. Doing so requires time, and you should approach it as if you were hiring an employee. References are always brought to a job interview, our own references take the form of past clients, and current cases, which you can look at in our website. Looking at them will tell you just how committed we are in helping you get through your injury and ensuring that you’re given just what you need. Wolfson Law Firm has 55 plus years of representing personal injury clients. Jonah Wolfson the managing attorney is a bilingual personal injury and wrongful death lawyer who is ready to speak to you regarding your case. He and his legal team are only a phone call away at (855) 982-2067. They’ll work with you to ensure you’re given the medical, emotional, and financial care that you’re entitled to.